At the conclusion of the PHCC sponsored Industry Summit, it may have been apparent to the attendees that what they had explored was indeed a “summit” of expectations and lofty goals that will require a focused approach in the climb that faces them. That’s not to say it’s an uphill battle, “It was really meaningful to have representation from manufactures, suppliers and contractors at this meeting. The bottom line is that we all have to work together to succeed as an industry,” said Tom LeDuc, who attended the Summit in Chicago in September with 40 participants. Some of the familiar supply brands such as Delta Faucet, In-Sink-Erator and Moen attended along with representatives from the City of New York Association of Contracting Plumbers, The American Supply Association and the Plumbing Manufacturers Institute. Twelve contractors attended and participated in roundtable discussions. 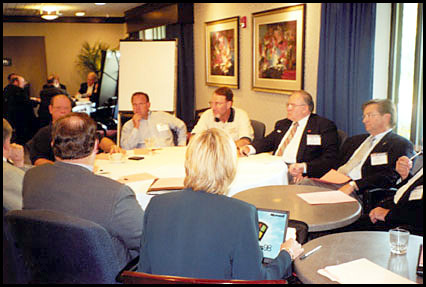 The entire Summit group identified education, industry partnerships and technology as their key concerns and after a day of meetings and group interaction, the group agreed to form task forces to support four initiatives: 1) Develop a “Site of Sites” industry website with educational and informational content as an all-inclusive resource for the entire plumbing industry. 2) Address the product warranties and recall process. 3) Develop educational programs for new and inexperienced contractors. 4) Develop a concise educational and licensing guide for each state to enable manufacturers in providing educational offerings to contractors.